I recently found an old, 1975 edition of the Geology and Man Motor Nature Trail Guide on my bookshelf. I must have bought it back in the day, probably on a trip to the Monument with my brother and parents. I can remember traveling along the bumpy road in a Dodge Dart, stopping at the points indicated while someone read the description of what we were looking at. Those were fun trips and as I haven’t done that since, I thought it was time to revisit the Geology Tour Road to see what I could find. Any italicized copy is taken from my 1975 copy of “Geology and Man: An 18-Mile Self-Guided Motor Nature Trail by Elden K. Wanrow, Park Naturalist." 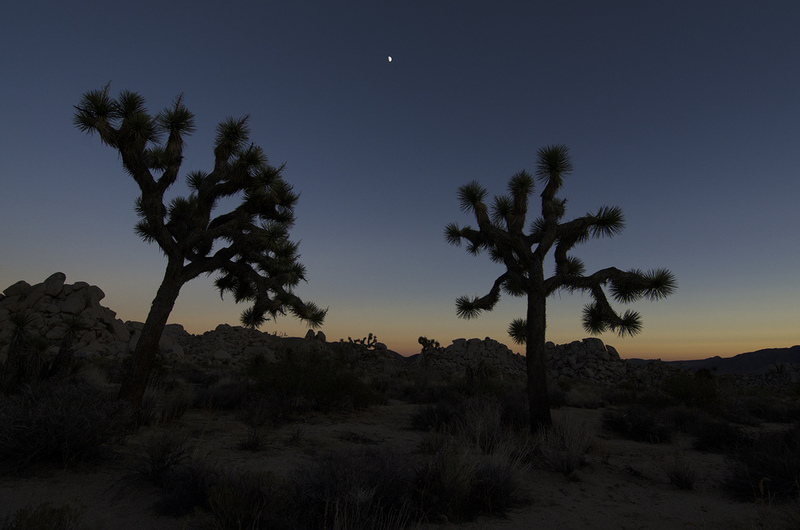 "This is your guide through some of the most fascinating landscape in Joshua Tree National Monument." 1. "WHY A VALLEY. Mountain-rimmed Queen Valley is one of two types of valleys to be found along the tour. 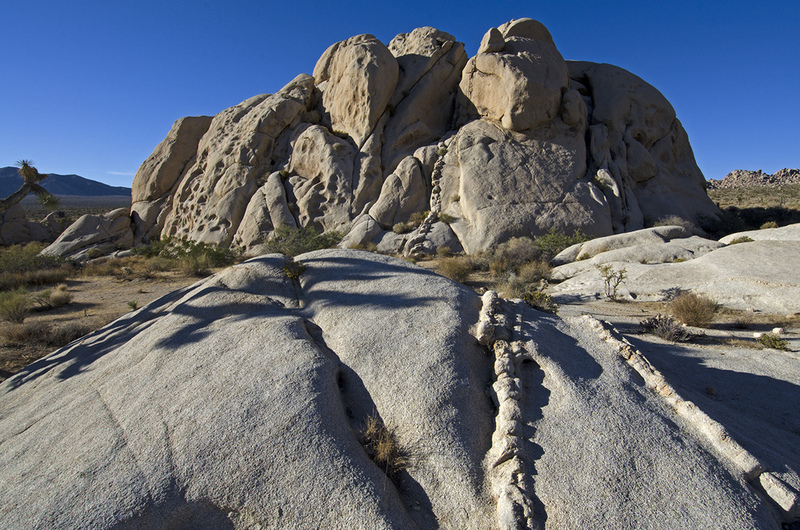 This and Lost Horse Valley (to the west) are formed by a difference in the rate of erosion between the rock underlying the valley itself and the rock composing the surrounding mountains. 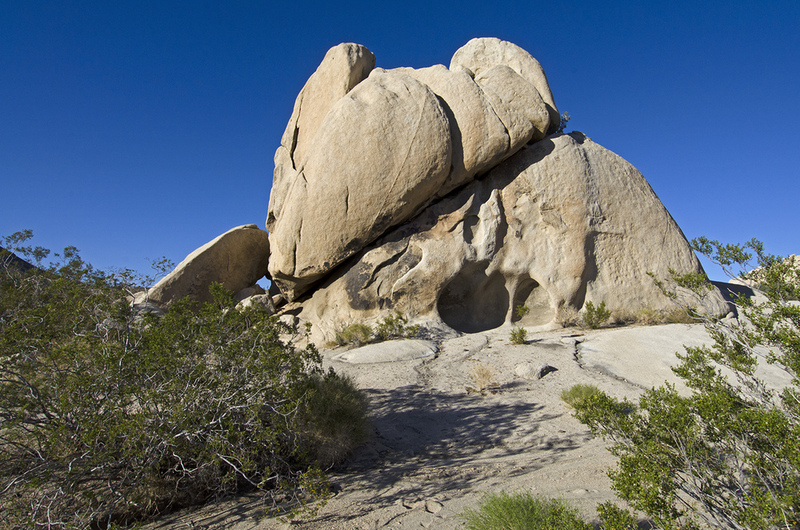 The rock making up those areas which are now valleys is generally less resistant to erosion than the rock forming the surrounding moutnains and disintegrates sooner to form a low-lying plain (or “valley”)." This is a pretty valley, the inselbergs rising from the floor are erosional elements from wayback. Checkout the large, black mountain in the middle of the valley, that's Malapai Hill and it makes a great reference point while traveling along the Geology Road. 2. "A RAINDROP DIVIDES. It is interesting to note that here on this knoll is the north-south drainage divide for the Monument. One would normally expect such a divide to occur on the crest of one of the mountain ranges to the north or south. Actually, water drains from this point either to the northwest via Quail Springs Wash, or to the southeast via Fried Liver Wash into Pinto Basin. 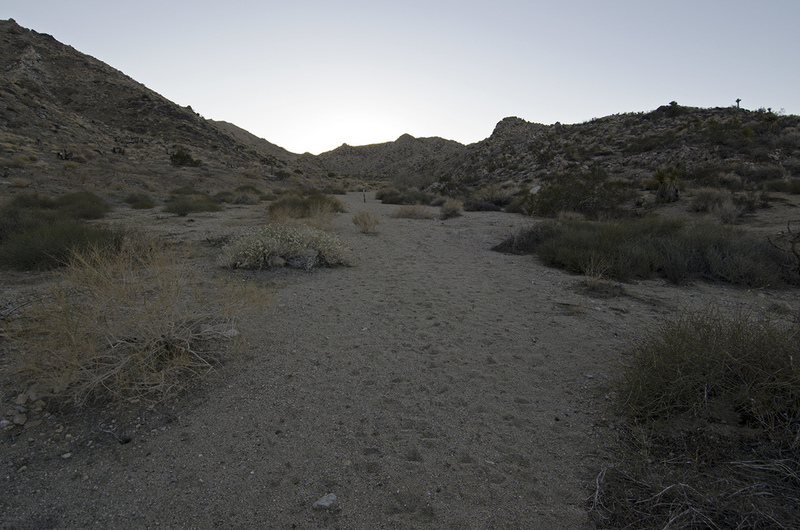 The power of running water plays an important part in shaping the desert landscape." It's not a very imposing spot, but an important one as far as rainfall is concerned. The desert floor is still showing a lot of green from the heavy rains the prior month. And how did Fried Liver Wash get its name? Panorama view looking over the "Raindrop Divide." 3. "NATURE’S GUTTER. Here, where run-off water accumulates to form a wash, we can see the effect of water in the desert. During the summer months, intense rainstorms often produce flash flooding along many desert washes. Rocks are physically and chemically broken down by falling and running water. The loosened material is carried to lower elevations by the flowing water and deposited. These deposits, called alluvial fans, will be seen later on in the tour. 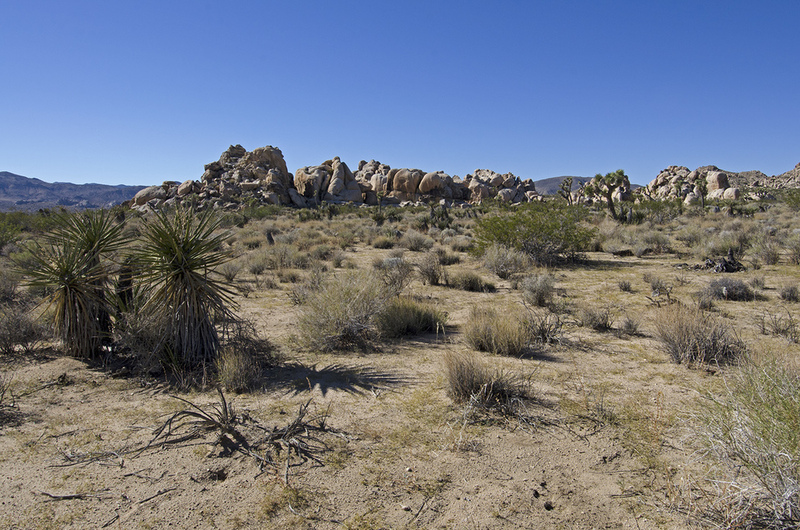 The increase soil moisture along these washes allows certain plants, such as the California juniper and the Parry nolina, to grow here more readily than on the drier surrounding desert." I love walking along the washes in J Tree. Many times they lead to interesting spots, places where man has left his mark on the desert. The only detraction is the sandy path does slow you down a bit. And there's always the chance of a flash flood, which is nice. If you're ever in a wash and you hear a rumbling roar, it's not the Wabash Cannonball, but more likely a wall of water heading your way so head for higher ground! There were some interesting looking rocks a little way off the road, so we decided the check them out. 4. "OLD EROSIONAL LEVEL. 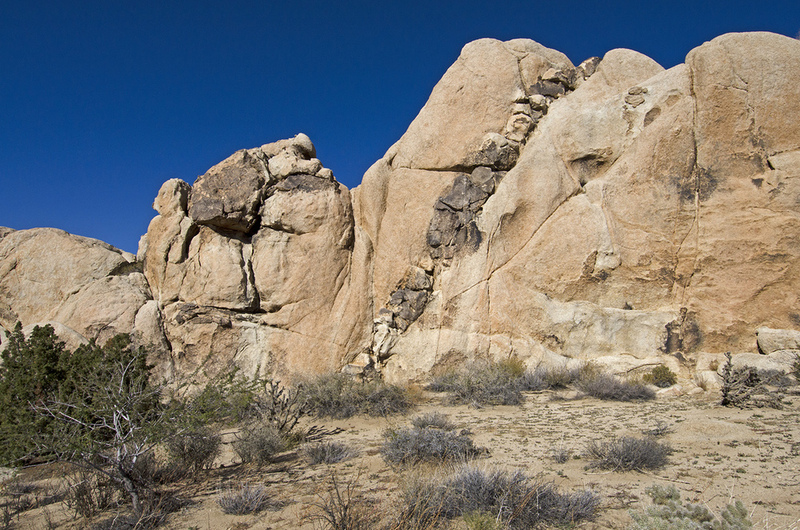 Many of the quartz monzonite boulders to the left (east) of the road bear a distinct groove or band about seven feet above ground level. 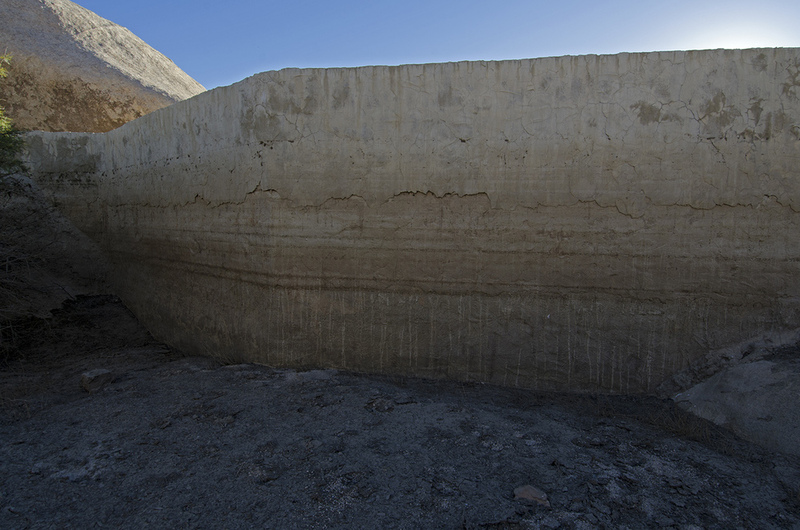 Geologists believe that this indicates an old erosional level during which the soil surface remained at one point for some time; perhaps, however, it indicates a more moist prehistoric climate during which time more water was available at ground level and the force of blowing sand eroded the rock more deeply at that point to produce the grooves. Subsequent erosion has lowered the soil to its present level. This illustrates how changes in climate produce corresponding changes in the landscape." One of the main things I enjoy about the Geology Road Tour is learning about things like this. I can't remember the number of times I've seen intriguing rock formations, or strange geologic happenings and wondered "how in the world did that happen?" Off to the right of this formation is a huge boulder that has split in half, and there are a lot of other rocks showing the old erosional level. The Old Erosional Level - very distinct on the rocks straight ahead. 5. "ROCK PILES. The quartz monzonite, forming the rock piles on both sides of the road, was once part of a molten mass which was forced upward into the overlying, older Pinto gneiss rock. The monzonite cooled without reaching the surface and crystalized to form solid rock. Erosion over the ages has stripped away the darker Pinto gneiss, exposing the monzonite outcrops as you see them. The mountains to the right (west) are composed primarily of gneiss, and Ryan Mountain, near Cap Rock, displays the contact between the two kinds of rock. Harder, more resistant areas within the monzonite form the numerous rock piles. Many of these have well-defined joint systems, while others have collapsed and are nothing more than jumbled piles of rock." It never ceases to amaze me, the giant piles of rocks. And there are a lot of them in Queen Valley. I still think they may have been placed there by giants. 6. "ROCK SCULPTURE. The monzonite was fractured into many cracks and joints, usually two sets intersecting at nearly right angles. The agents of erosion are best able to attack the rock along these zones of weakness and weathering occurs at a faster rate. 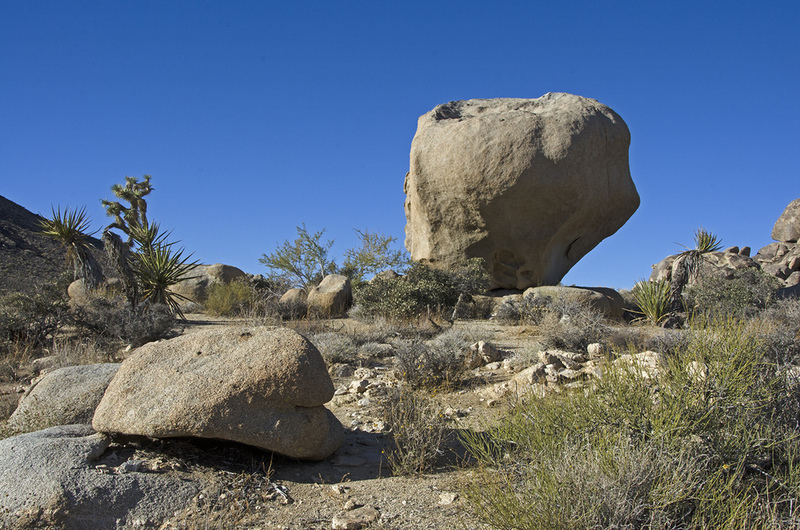 The result is boulders which are roughly rectangular in shape. 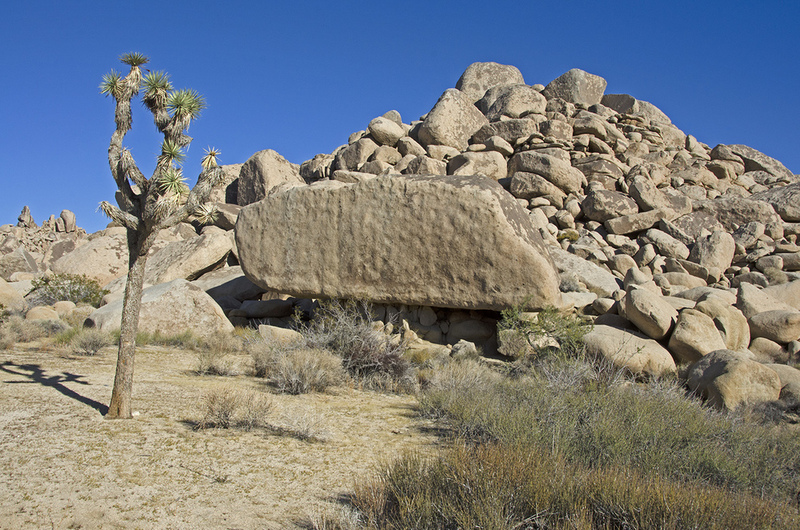 A massive rectangular boulder to the left of the road illustrates this type of erosion." 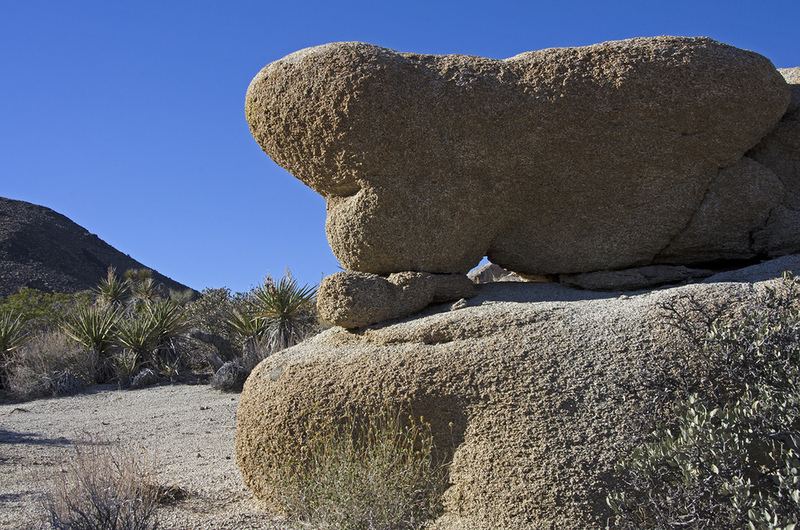 So THAT's how you get a giant rock that looks like a loaf of bread. I've seen square and rectangular rocks all over the park, sometimes they're so perfect that you'd think they must have been chiseled. But nature can do all kinds of interesting things. 7. "MALAPAI HILL. Three-quarters of a mile west of this point the twin peaks of Malapai Hill rise about 400 feet above the valley floor. The hill is composed largely of black basalt and apparently resulted from a shallow injection of molten or liquid material which did not quite reach the surface of the earth. If it had reached the surface, a lava flow or volcano would have resulted, but no such flow exists. The basalt intrudes the quartz monzonite and is probably quite young, thought its true age is unknown. It could have formed within the last two or three million years, which is quite recent compared to the gneiss, which is over 700 million years old." I'm going to climb this hill one of these days. It looks like the easiest route would be straight up towards the saddle and then cross-hill to the top. I'm sure it'll give a superb panorama of the valley and the surrounding mountains. There is a great "Balanced Boulder" near the base of Malapai Hill which I hiked out to during this trip. There are apparently also some nice examples of columnar jointing which stick out of the northwest side of the hill. I'll have to check that out on my next trip. This stop on the Geology Tour Road is well worth getting out of the car and exploring. Check the grid below the main image for some interesting spots around Malapai Hill. 8. "ALLUVIAL FANS. You are now descending an alluvial fan. Notice a similar fan extending from the mountains into the valley directly in front of you. These fans are composed of sand, gravel and rock produced from the erosion of rocks at higher elevations. This material is carried by gravity and flood waters to lower levels. Here it is deposited, the larger, heavier rocks being dropped first, and the lighter sands and gravels being carried father out into the valley. The alluvial fans illustrate the constant change that is taking place. Mountains are being destroyed and the material is being deposited. Some might be consolidated into rock which could thrust up as new mountains." Sometimes I don't even realize I'm driving down an alluvial fan until I get to the bottom and look back up. When several of them grow large enough to connect, like they do across the valley, they become a bajada. This picture shows the road on the left descending down an alluvial fan and off in the distance, the return road also descending an alluvial fan, that one from the mouth of Pinyon Canyon. 9. "SQUAW TANK. At this point in our tour, man enters the scene and we can see evidence of how his natural environment has been used to good advantage. Archaeological investigations tell us that nomadic Indians inhabited this area from about 1000 A.D. until the turn of the century. Squaw Tank was a favorite campsite for them. Bowl-like mortars were hollowed into flat surfaces of the quartz monzonite and were used to grind seeds and other bits of food into meal. Several of these bedrock mortars can be seen just south of the large rock in front of you. About 100 feet farther to the southeast, and in the wash, can be seen a concrete dam which forms Squaw Tank. Cattlemen built this and other similar dams to catch run-off water for their cattle during the early 1900’s. Many of these dams are located where “natural tanks” or pools of water collected after rains. It was in such places that the Indians also obtained water." This is one of my three favorite stops along the Geology Tour Road, there is so much going on right here and just nearby. 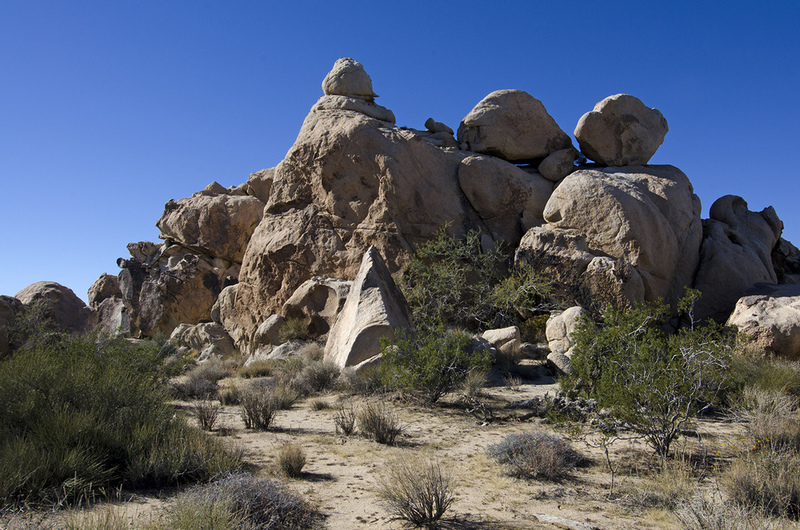 The huge outcrops of White Tank monzogranite provide a full day's worth of climbing and exploring. 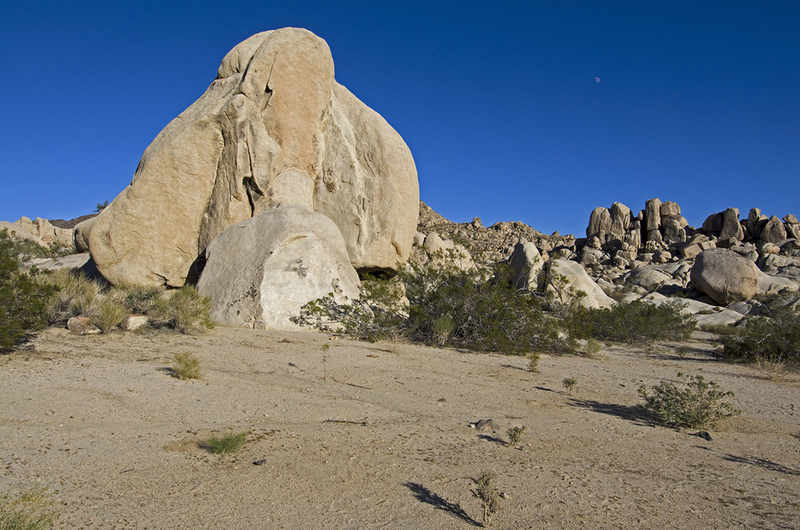 One of the most interesting is a bit northeast of the main rock located at the parking area. It's an excellent example of "tafoni" weathering, which produces a honeycomb-like surface. It's almost like someone carved steps into the face of the rock. You'll recognize this rock as soon as you see it. (Skull Rock, over near Jumbo Rocks, is also an example of tafoni weathering.) With only a little searching I found three Indian bedrock mortars. And the concrete dam is pretty cool too. Spend some time at this stop and explore the surrounding area, it's well worth the time. Big rock at the parking area. 10. "PLEASANT VALLEY. As you rounded the point of rocks and viewed the eastern section of Pleasant Valley, the steep mountain in front of and to your left was probably most impressive. 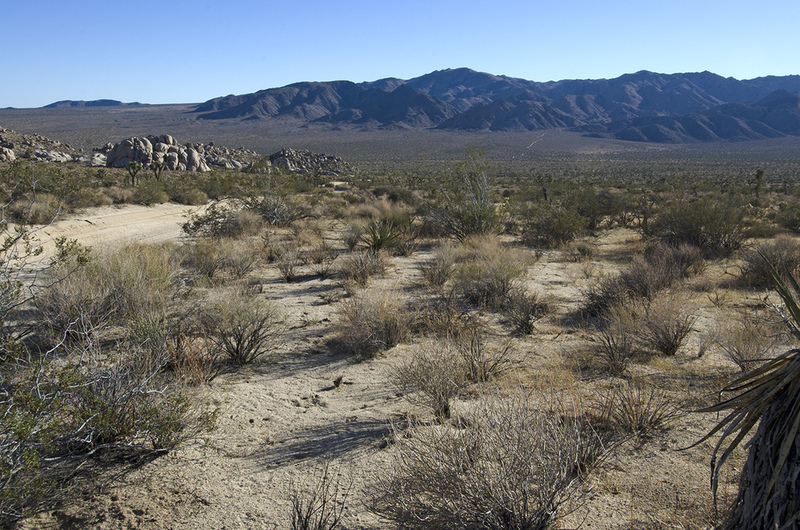 This scarp is a result of the Blue Cut fault which has a 50-mile trace stretching from the western foot of the Little San Bernardino Mountains to the eastern edge of the Pinto Basin. The fault follows the base of the mountain before you. To the left of the fault the land has uplifted, and to the right the terrain has dropped or subsided. This combination of uplifting and lowering has created Pleasant Valley, the second type of valley that you have seen (the first being Queen Valley, a result of differential erosion). The Blue Cut Fault is named for the blue material (blue granodiorite) found along the fault zone. The blue exposed on the mountainside to the west (rear) is blue granodiorite and marks the fault. PETROGLYPHS. 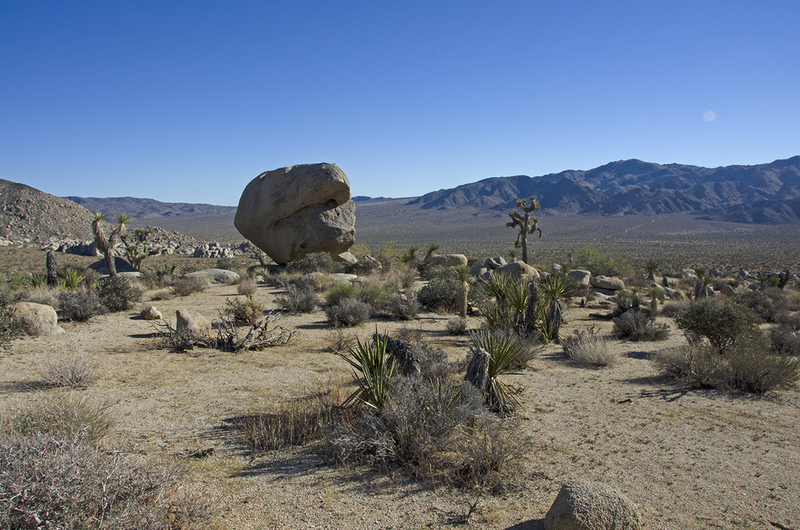 Petroglyphs or Indian rock carvings can be seen about 150 feet to the left. These are usually found on the rocks which have a coating of “desert varnish,” a chemical deposit which forms on many desert rocks. When the outer layer is chipped away, it exposes the light rock beneath. It is thought that these carving had some religious meaning to the Indians, but this is only conjecture. Many of the carvings may be hundreds or even thousands of years old, because the desert varnish has reformed on some of them and this takes a long period of time. Please help protect this prehistoric Indian art." I couldn't find the sign post of this stop, but that's not really surprising considering the harsh conditions out here. This stop is not very far from Squaw Tank, be on the lookout for where the piles of dark colored rock meet the lighter, White Tank monzogranite on the hillside to the left. There's a great view of Pleasant Valley from here, but I think the most interesting thing about this stop is up there in those dark rocks, with the snakes and scorpions. Petroglyphs. I remember finding them many years ago and naively wondering if they were authentic. It only took a minute or two to find them again. Even with the vandalization they've suffered, they are still worth the hunt. 11. "DRY LAKE. This dry lake or playa which you are now crossing is evidence of a wetter climate during which a periodic lake existed in Pleasant Valley. Sediments were deposited in this lake to a depth of hundreds of feet. As the lake dried up, salts in solution were crystalized out and deposited. Many of these dry lakes throughout other parts of the desert are mined commercially for various salts. After heavy rains many of the dry lakes become temporarily “wet” lakes." This stop gave Murbachi and I some trouble. We couldn't find the signpost and the description said "This dry lake which you are now crossing," which didn't jive with the location of the next stops. In any case, that big flat area out there is a dry lake. It could be my old guide was a little mixed up. The current Geology Road Tour pamphlet lists stop #11 as: "DEBRIS FLOW. At the mouth of the steep canyon to the left there are irregular mounds of Pinto gneiss rock-debris without a patina. A number of times during the heavy rains debris has oozed in slow-moving, viscous masses down the canyon and come to a halt near the mouth." "SAND DUNES. To the left, notice the sand deposits and the start of sand dune formation. This is typical of areas where there is a source of sand (the dry lake), and open flat area (Pleasant Valley) where wind can gain enough force to pick up sand particles and carry them, and some barrier (the mountain front) which slows the wind so that its load of sand is deposited." This entry in my old guide is also probably mis-placed. It should be out there where the road is crossing the playa. 12. "MINES. The mountain slopes in front and to your left (north) are honeycombed with tunnels and shafts dug by miners of gold and other precious metals. There was extensive mining activity throughout the area during the late 1800’s and early 1900’s. Very few of the mines were profitable due to limited high-grade ore; the Lost Horse Mine is one of the exceptions. Gold, silver, copper, lead, and other metals of economic importance are believed to be deposited when intruding magma cools and crystalizes, and various gasses and liquid solutions rise from the magma. As these move upward through the rock they cool and deposit dissolved material along the way. This deposition usually occurred in pre-existing fractures or fissures, resulting in a limited vein of the metal. 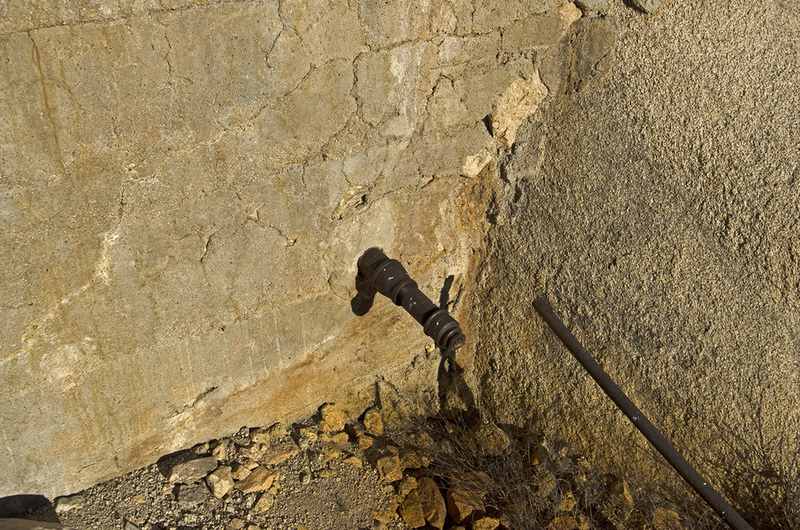 Quartz is often associated with these veins and is an indication of possible valuable deposits." Here is the second of my three favorite stops along the Geology Road Tour. The parking area near the backcountry registration board is next to two old tanks. They were used either for water or cyanide. There are some old mill foundations near the tanks. This was the site of the Galena Mill, which was utilized by the Gold Coin Mine located a little farther east and up the mountainside. I'll be posting an in-depth article on the Gold Coin Mine in the near future, so all I'll say about it here is, it's a fun place to poke around. The two tanks near mill foundations. 13. "CATTLE RANCHING. Here, along the base of the alluvial fan, where soils are deeper and run-off water accumulates, more plants, especially grasses, are able to survive. Lush vegetation drew cattlemen to the area. Texas longhorns were first brought in during the 1870’s. Over-grazing and a continued drought since 1932 led to the decline of the range. The numerous cholla cacti in the area indicate an overused range. These replace the grasses as the latter die. The elimination of grazing, with the establishment of the Monument in 1936, has allowed the range to restore itself and only now do we see much evidence of grass." This stop is no longer "Cattle Ranching." In the new guide it is the "Dry Lake" stop. It's only about a tenth of a mile from the stop #12, Mines. I've read in other sources how many areas of J Tree were used for cattle ranching in the early parts of the 20th century. Things have certainly changed over the last 100 years. Overgrazing may have played a part, but I'm guessing that climate change had more to do with it. 14. "PINTO GNEISS. 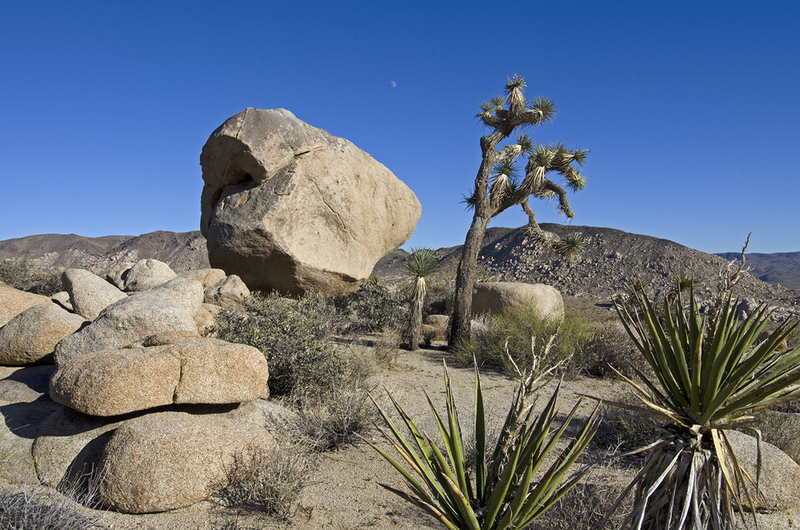 The banded and folded rock to your left, probably the oldest type of rock in the Monument, is Pinto gneiss. Although its absolute age is not known, it is thought to be more than 700 million years. Whereas the basalt of Malapai Hill and the quartz monzonite are igneous rocks—the product of a cooled magma—the gneiss is the product of metamorphism. 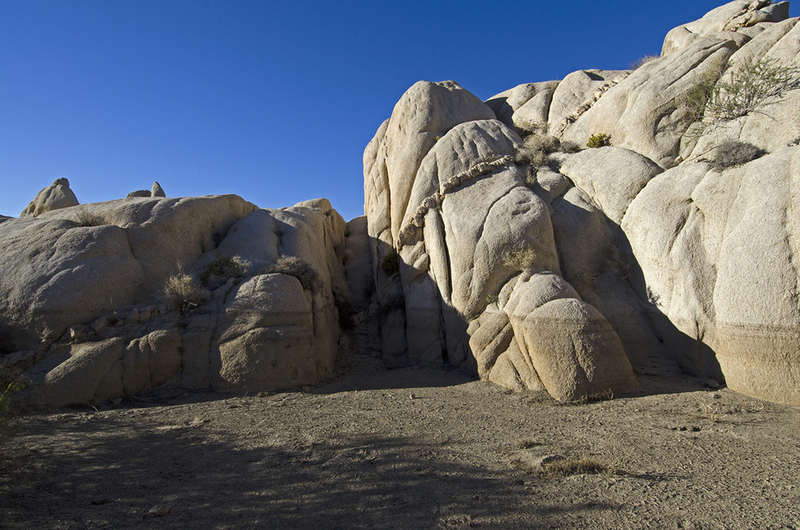 Metamorphism is the change in the structure of rocks due to pressure, heat or chemical action. Geologists believe that the gneiss was originally sedimentary material, laid down in ancient lakes or seas, which has undergone change due to the pressure of overlying material and internal heat. This change results in a realignment of the chemical constituents of the former rock to produce a new rock." "LICHENS. The bright splotches of color found on many of the rocks are primitive forms of plant life called lichens. The different colors indicate different species or kinds. Some form a weak carbonic acid which can chemically break down rock to form soil. These tiny plants form a very important part of the erosional cycle and are indirectly beneficial to man, who is dependent on the soil for his existence." The twisted and banded exposure here of the old Pinto Gneiss is pretty amazing. The lichen seem to like the gneiss. 15. "PINYON WELL JUNCTION. Road to the left is a dead-end road and not part of the Geology Tour. It is not maintained. A well in this canyon provide water which was necessary for the processing of gold ore and for watering cattle. The well is now dry." Here is the third of my favorite three stops along the tour. The view looking out over the valley is superb from this spot, with a great shot across at Malapai Hill. The main reason I like this stop is Pinyon Canyon and Pushawalla Pass. There are some very interesting and historic mining-related locations farther up the canyon. Hensen Well, Hensen Mill, New Eldorado Mill, Pinyon Mine and others are all up there in the wilderness. They are on my list of soon-to-visit places. What used to be the road leading into the canyon is blocked, you'll have to get out and start hiking here. "PANORAMIC VIEW. Aside from being an outstanding picture point, this stop affords the opportunity to review at one glance many of the geologic processes seen along the tour. As was pointed out in the introduction, geology is the study of the history of the earth and is manifest by a constant series of changes which involve mountain building, their destruction and subsequent rebuilding. We see evidence of mountain building in the mountain range formed along the Blue Cut fault north of Pleasant Valley. We see mountains formed by igneous intrusion in Malapai Hill and the quartz monzonite rock piles. And finally, we see them being destroyed and carried away to be deposited as alluvia fans or as sand dunes around a dry lake. And throughout, we have seen how many has utilized the products of geology to his advantage." After stop #15, the one-way road continues down into the valley and reconnects to the two-way traffic portion of the Geology Tour Road. And just because there aren't any scheduled stops along the way, it's still an interesting drive with great scenery on both sides of the road. Do what I do, stop and see what you can find. Checkout a quick video of Geology Tour Road!